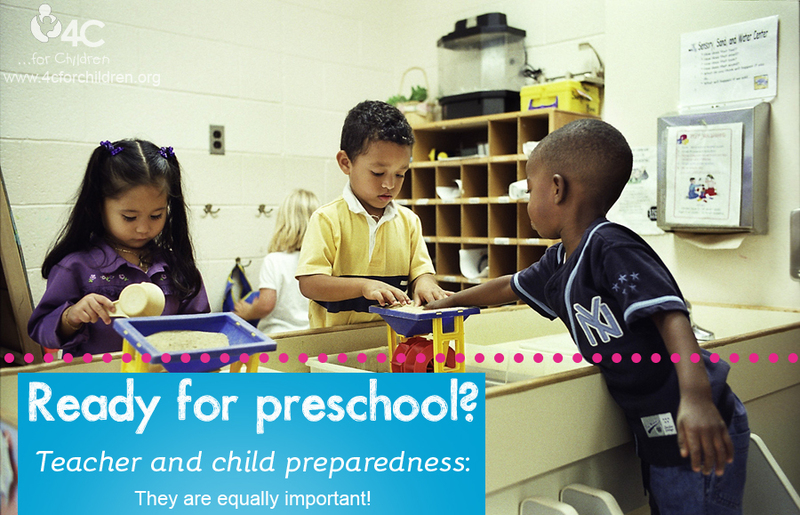 Who should be ready, the preschool or the preschooler? I was looking through the Sunday ads in the newspaper this past weekend and I noticed that back-to-school advertisements are in full force. New glue sticks and scissors, notebooks and pencils are all part of the back-to-school rituals at my house. I was talking with a good friend of mine about the trials and tribulations of sending kids back to school with the myriad of supplies that need to be purchased. She doesn’t have children who are old enough for elementary school yet. She does however have a 3 year-old son so I asked if she was planning to send him to preschool this year. Her answer surprised me. She said that she didn’t think he was ready. And that got me thinking, who needs to be ready, the preschool or the preschooler? As a former classroom teacher for children ages 3 – 5, I spent many hours preparing the environment for the children who were enrolled in my classroom. I worked hard to have a safe space with materials that were interesting and engaging. I planned my lessons by starting with the knowledge of what children who are ages 3 – 5 should be able to do and what I hoped they would be able to do by the time they left to go to kindergarten. For all children who entered my room, my hope was that they came to play each day so that I could get to know them and plan things that were of interest to them. I hoped that they had a change of clothes just in case we found ourselves immersed in something messy. I hoped that they learned to love learning. I hope that I challenged them to try something new. I believe that it was my responsibility to be prepared for the children who came each day. So as you look forward to a new set of children in your classroom this year, I hope you take time to be ready for them. Happy New School Year! This entry was posted in Best Practice, Preschool and tagged classroom transition, preschool teachers on July 30, 2014 by angiegood.